Whether stocking up for winter to use your wood burning stove or enjoying the long summer nights with your chiminea, we can supply top quality seasoned firewood any time of the year. When buying firewood make sure that you are buying seasoned firewood. That should mean that it was cut and split at least a year ago and then stored so that air and sun can dry it out. We have industrial green houses drying 24/7 365 days a year no matter what the weather, they are always drying. 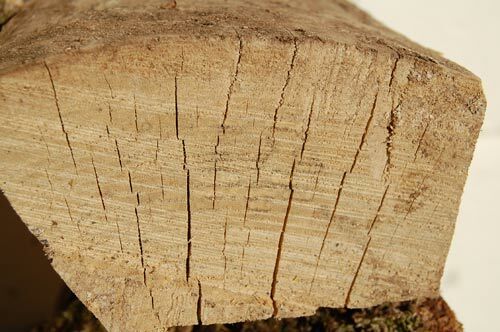 Often you will find that the firewood supplier will cut and chop the tree up that day – yes its been lying around for a year or two, but seasoned it is not. A good sign to look out for is cracks in the end grain of the logs like this. No matter what type of wood you choose for your stove, it is important that the wood is dried before you burn. Wood that hasn’t been dried wastes much of the energy created while burning in removing water from the log and producing steam. Our wood will dry for a minimum of 12 months until it has a moisture content of 20% or less – but how do you know when it’s reached the magic number? The easiest method uses a moisture meter which inserts steel pins into the wood to obtain a reading of the moisture content. Many people try and burn logs they’ve cut themselves, but if they’ve not allowed enough time for the logs to season, the results can be quite disappointing. Our logs are fully seasoned and ready to burn – so you know our logs and your wood burner will give you the roaring fire you’ve always wanted! We set up a joint business in 2015 after the increase in demand for firewood and the craze of wood-burning stoves and multi fuel burners becoming more and more popular. Also the amount of tree work our tree surgeons have been doing for local and national trust sites/ local authorities/ private contractors. I have owned a multi fuel burner for many years and I have just processed and dried my own wood in our industrial green houses. Like I said prior with the amount of wood we have coming through we started to process more wood for public sale. Who is L&L ? Me and my wife decided to call the business L&L after the birth of our children Lexi-Amelia and Lewis.